With that big heart, this could be none other than Corazon. Mother Nature finally graced Disappointment Valley with a bit of graupel and feathery snowflakes, but very little and very light, and it was gone very quickly. Snow remains – as you see – in the far distance – and at higher elevations. 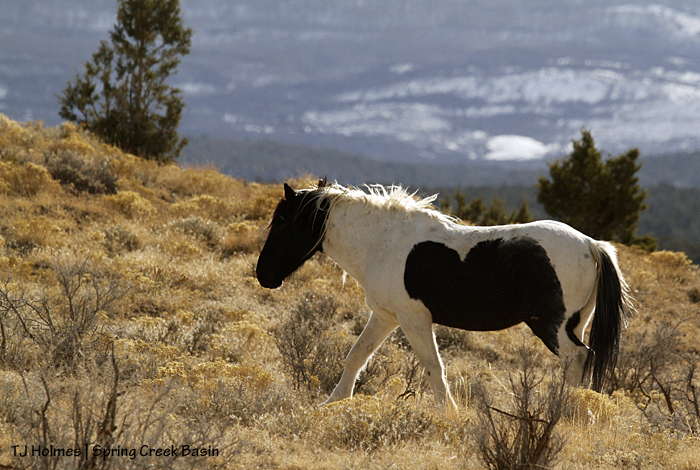 Black beauty Aurora walks past the rimrocks above Spring Creek canyon. We’ve gone almost two weeks without moisture, but there’s almost always water down in the canyon or in the arroyo leading to the canyon. Amazingly, Spring Creek has run several times this year because of big rains over the basin. It doesn’t run very long (a full day is a long time), but it’s a small miracle when it does. This bit of action between Hollywood and Chrome happened just after Sundance thought he was being left. 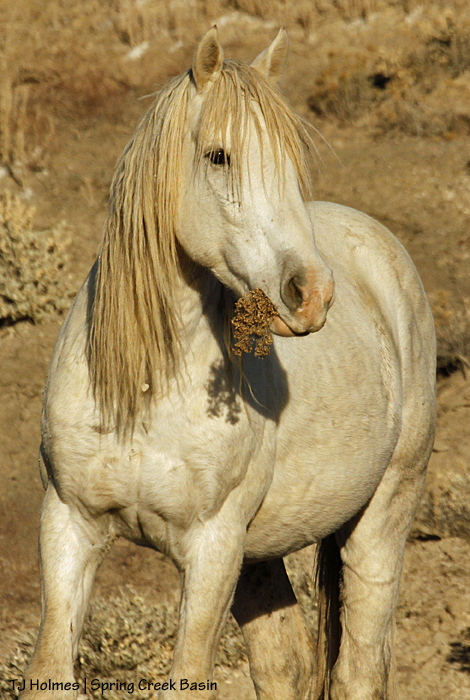 Sundance, a bachelor, looked up mid-chew to see that his band was heading through an arroyo and over the ridge. Thanksgiving has long been my favorite holiday, a time to outwardly express the gratefulness I feel year ’round. Sometimes (most of the time), I’m fairly bursting with gratitude! 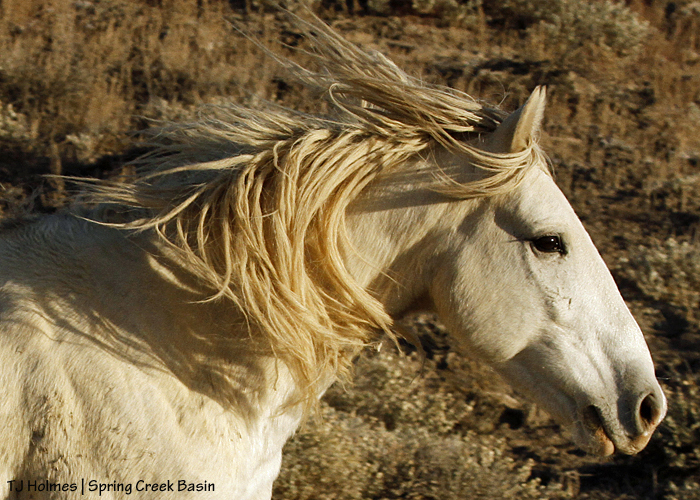 Thank you, especially, dear readers who are interested in our Spring Creek Basin mustangs and have followed the evolution of this blog highlighting them. To be able to share my wonder in and gratitude for the mustangs is immeasurably fulfilling. 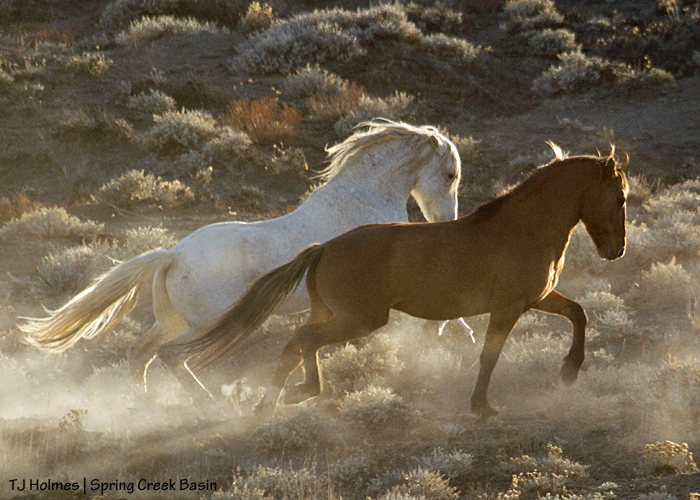 At the top of my list: My parents and brother, for being awesome, for raising us with horses, for *getting* my love of wild places and wild horses. 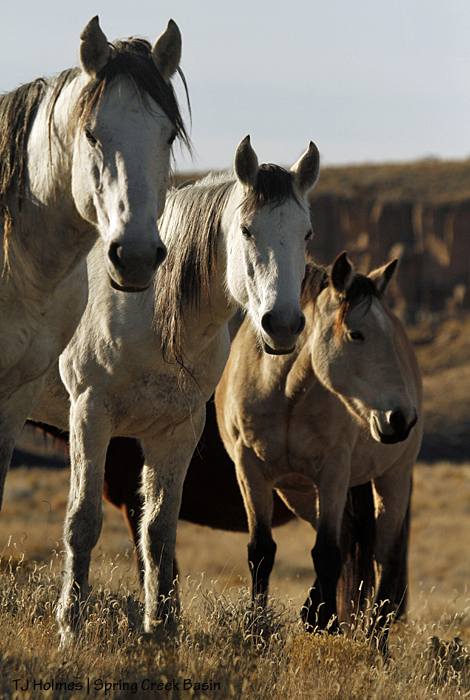 The mustangs – everywhere – for all that they have given and give, for the magic they bring to the world, the beauty with which they fill it. Friends, fellow advocates, neighbors; each of you brings a wealth of joy to my life. My boss, who knows just exactly what this means to me. Disappointment Valley and Spring Creek Basin, here long before me … here long after me … for all those who came and stayed or passed through … for the protections in place in parts of this part of the world … for the absolute magic of place. 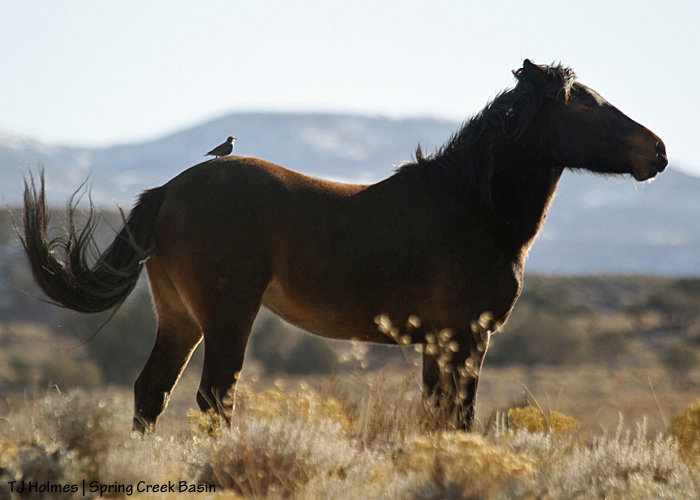 Our BLM herd manager, who proves to be an enthusiastic partner in the good management and protection of our beloved horses. Every single one of *my* horses; for each of you, everything. 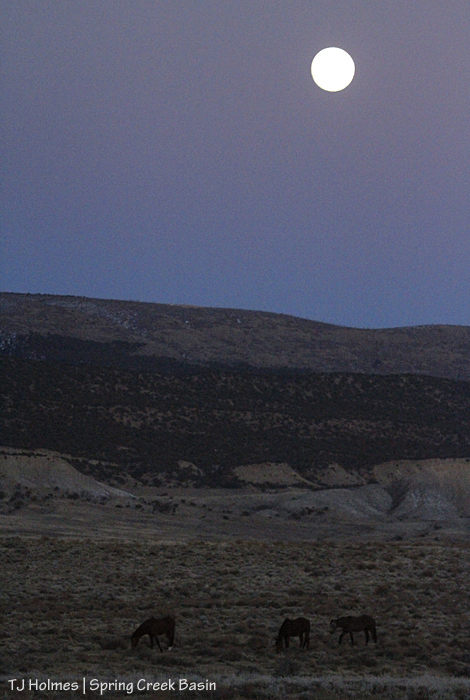 A full moon rises over wild ponies and Spring Creek Basin. It was a super, incredible, amazing, fulfilling day, from beginning to end. These are the kinds of days, with the kinds of experiences, that stamp photographic memories in our brains and on our hearts. 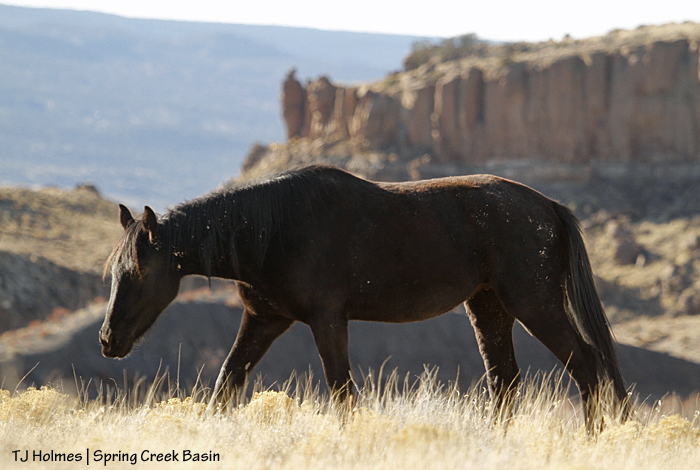 So glad to see these sparkling faces on a clear-blue day in Spring Creek Basin! Unreality: Parts of our soil are damp – still – a week after our last rain/snow storm. Beautiful, wonderful, welcome fall moisture! And more – hopefully – is coming later this week. Blessed are we who are grateful!